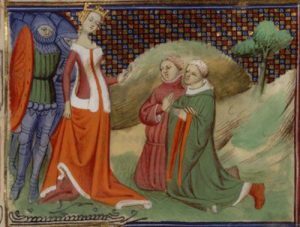 Paris, Bibliothèque nationale de France, ms. français 2663, folio 14v: Queen Isabella of England admonishes two of Edward II’s favourites, Sir Hugh Despenser and Edmund, earl of Arundel, prior to their execution, 1326. Image credit: Wikimedia Commons. In the later Middle Ages there was a considerable appetite for regimens of health, texts that provided advice about how to remain healthy and combat illness. Medical advice today depends for its efficacy on several factors, from evidence-based proof to the placebo effect, but ultimately it comes down to the trustworthiness of the source of the advice, which influences how likely it is to be followed. We rely largely on the reputation of the medical profession, founded on the systematic training and registration of doctors. Even so, we still pay attention to the individual reputation of practitioners and personal recommendations by family and friends when making decisions about our own healthcare. For most of human history, trust in the efficacy of medicine has been founded primarily on practitioners’ personal reputations, rather than on faith in impersonal institutional structures. Hence the tendency to ascribe medical texts in the Middle Ages to known historical figures of proven authority – Aristotle, Galen, Arnold of Villanova – or mythical or semi-mythical ones – Hermes, Hippocrates, Trotula. A variation on this tendency was the use of non-medical high status individuals to authenticate remedies and cures. An interesting English medical work of the later Middle Ages, the so-called ‘Dietary of Queen Isabella’, provides an example of a work that not only calls in evidence the authority of a queen, but bolsters it by adducing the weighty learning of the most famous medical schools in Europe. MS. 5262, folio 54r: opening of the ‘Dietary of Queen Isabella’. Wellcome Images L0064553. The ‘Dietary of Queen Isabella’ is a short guide to maintaining health and combating illness organised in five parts, corresponding to the brain, the eyes, the chest, the heart and the stomach. The work is written in Middle English and survives in multiple variants, but all have this structure in common, and most are ascribed to the medical school of Montpellier, from where the text is said to have been obtained by the king of France for the benefit of his sister, Queen Isabella of England. The only candidate for this Queen Isabella is Edward II’s queen, sister of Philip the Fair of France, who died in 1358. 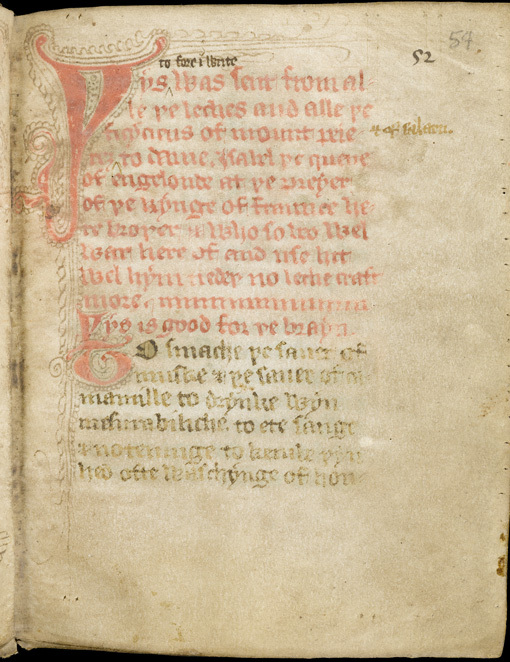 The earliest known witness to the text is in British Library Sloane MS. 100, dating from the early 15th century. 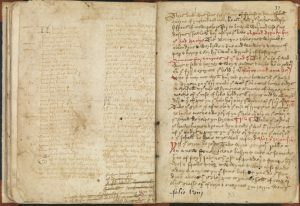 The Wellcome Library holds three further witnesses representing multiple variants (in MSS. 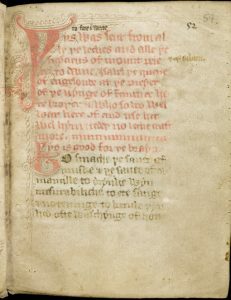 397, 408 and 5262), all from the 15th century, as well as a 15th-century recipe compilation that owes much to the ‘Dietary’ and is indeed likewise ascribed to the same royal source (in MS. 404). 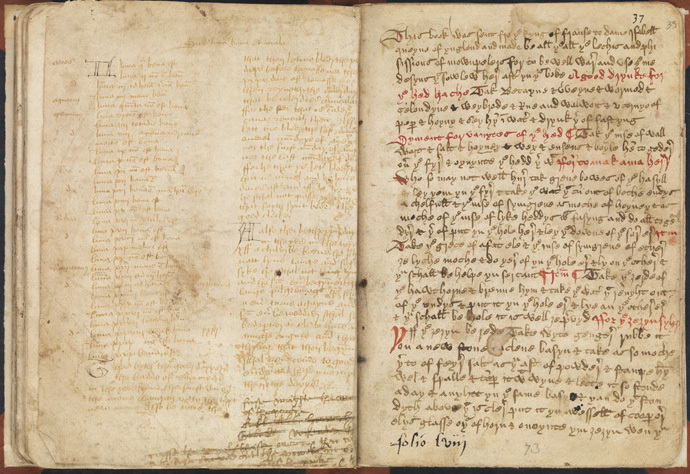 MS. 404, folios 34v–35r: opening (on folio 35r) of a collection of medical recipes ascribed to Queen Isabella. Wellcome Images L0073823. Yet there is no evidence that the work had any connection with Isabella or was even composed during her lifetime. On the contrary, it seems to have been an amalgam of medical lore extracted from several Latin sources, rendered in simplified form in the vernacular for a non-Latinate readership. It certainly betrays no female bias, as one might expect of a dietary designed for the benefit of a woman’s health in particular. At first sight Edward II’s queen would seem an unlikely authority figure for a medical regimen. An adulteress who conspired to undermine Edward’s rule, had his favourites executed, arranged for his arrest and was even implicated in his murder, the historical Isabella was about as far removed from a queen embodying beneficent concern about health as can be imagined. Why then would any medieval author select her as a suitable candidate to validate a text? Isabella may have had some reputation as a medical expert: her name is associated in another British Library manuscript (Sloane MS. 964) with an elixir of youth, a miraculous water that apparently rekindled the 70-year old queen’s sexual appetite (notwithstanding that the historical Isabella actually died in her early sixties). By the later 14th century, moreover, it is probable that Isabella’s prestige as the mother of Edward III would have begun to trump her evil reputation. Neither of these factors however seems a very persuasive explanation. More important surely was Isabella’s suitability to fill a role that was becoming something of a literary trope, the foreign princess who brings the medical knowledge of her native land and court to her new home, for the enlightenment of her new subjects. The much more substantial vernacular regimen of health known as the ‘Régime du corps’, ascribed to Aldobrandino of Siena, is said in one version to have been composed in 1256 for Beatrice of Savoy, countess of Provence, for transmission to her daughters, respectively queens of France, England and ‘Germany’, and countess of Anjou. Edward III’s queen, Philippa of Hainault, is associated with a Middle English treatise on the virtues of rosemary, supposedly sent to her by her mother. 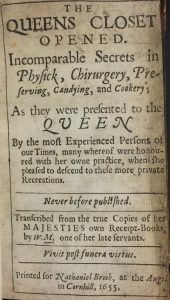 In the early modern period, the book of recipes entitled ‘The queen’s closet opened’ (1654), ascribed to Queen Henrietta Maria, represents a late flourishing of this tradition. Indeed, so interchangeable do these royal authority figures become that an early 16th-century owner of Wellcome MS. 404, listing the contents of the manuscript, substitutes the name of Philippa for Isabella, and Salerno for Montpellier. 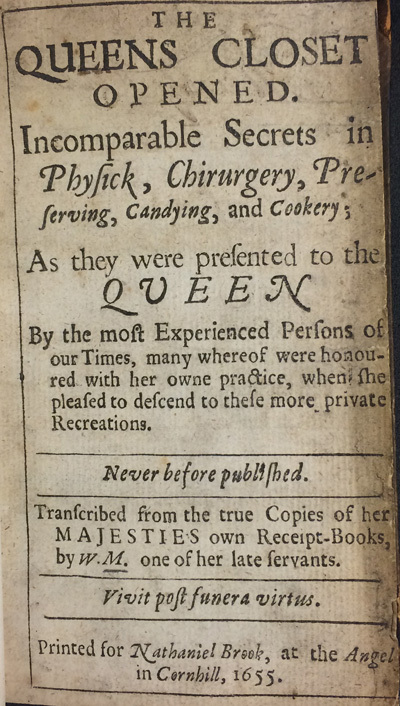 Title-page of EPB/34553/A, Part 1: The Queens closet opened: Incomparable secrets in physick, chirurgery, preserving, candying, and cookery ([London]: Printed for Nathaniel Brook at the Angel in Cornhill, 1655). Image credit: Elma Brenner. Yet if these origin stories are almost certainly entirely mythical, they nevertheless embody a wider truth. A foreign princess moving to a new land when she married would have been accompanied by household servants, including medical attendants, who would collectively have brought something of the medical traditions of their own land with them. Moreover, she could well have been furnished with a collection of medical recipes to ensure her well-being in an alien environment, just as early modern women leaving the parental household on marriage might be provided with a digest of remedies. Queen Isabella may have had nothing to do with the dietary named after her, but as a foreign princess of recent memory she provided a convenient source of authority and validation for this text. W. L. Braekman, Studies on alchemy, diet, medecine [sic] and prognostication in Middle English (Brussels: UFSAL, 1986). Françoise Fery-Hue, ‘Le Régime du corps d’Aldebrandin de Sienne: tradition manuscrite et diffusion’, in Santé, médecine et assistance au Moyen Âge (Paris: Éditions du C.T.H.S., 1987), pp. 113–34. George R. Keiser, ‘Rosemary: not just for remembrance’, in Health and healing from the medieval garden, ed. Peter Dendle and Alain Touwaide (Woodbridge: Boydell Press, 2008), pp. 180–204.